The Aynsley Lister Band return to The Flowerpot in Derby on Friday, September 25, for a an eagerly-awaited gig . When explosive natural ability collides with fiery, emotionally charged compositions, the result is Aynsley Lister, an incredible guitarist whose brand of blues-based rock delivers contemporary songwriting fuelled with the kind of heart and soul that’s missing from so much modern music. Whether passionately writing and recording his own material or mesmerising audiences at his live shows one thing is abundantly clear: music is hard-wired to his DNA and flows from his fingertips. Then, on Saturday, September 26, you can see A Foreigner’s Journey, with their tribute to the music of Foreigner and Journey. Foreigner and Journey are giants of the genre best known as Adult Orientated Rock and have been huge draws as live acts since forming in the 1970s. The two bands have achieved massive commercial and critical success. 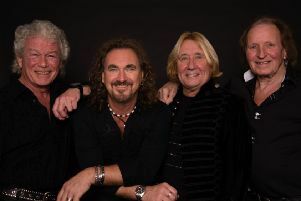 A Foreigner’s Journe have toured throughout the UK and Europe for the last six years and headlined a number of festivals, safely establishing themselves as one of the most respected and known tribute shows around. Cherry picking the very best songs from each of the two bands, bona fide rock classics such as Don’t Stop Believing, Separate Ways, Cold As Ice, Juke Box Hero and many more. Doors open at 8pm. Admission is £12 for Aynsley Lister Band, and £10 for A Foreigner’s Journey.